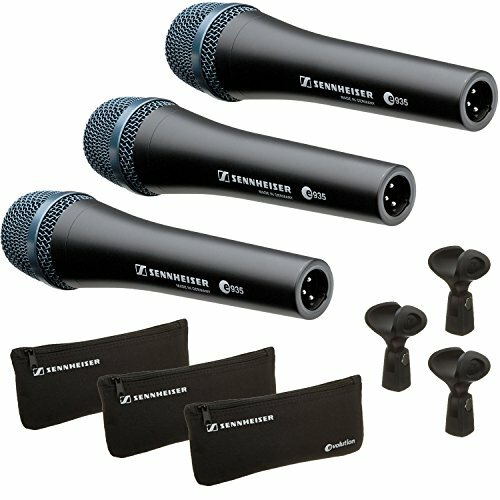 The Sennheiser E935 is a handheld cardioid vocal microphone with a tailored frequency response suitable for vocal and performance applications. The E935's cardioid design effectively denies axis noise and feedback while an integral hum compensation coil minimizes hum caused by electrical current, bad grounds etc. It's 40-16,000Hz frequency response is tailored for vocal use and the neodymium capsule withstands extreme sound pressure levels. The shock mounted capsule and rugged metal enclosure provide durability in the studio or on the road. The E935 features a cardioid polar pattern, effective in rejecting off axis signal that can cause noise and feedback. The integral Hum Coil is effective on reducing line and electrical hum. The E935 features a tailored 40-16,000Hz frequency response for accurate reproduction of vocals and relative signals. The capsule also withstands extreme sound pressure levels. The rugged all metal construction and shock mounted capsule result in durability in the studio and on the road.